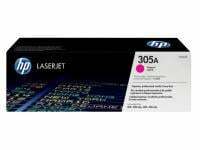 HP 305A Magenta LaserJet Toner Cartridge makes documents and marketing materials look professional. Maintain productivity by avoiding wasted time and supplies. These cartridges are specially designed for your HP LaserJet Pro printer. Make a professional impact with documents and marketing materials by printing with stunning colour and black text. Maximise impact with photo-quality graphics and images, and business-quality results on a wide range of laser papers. Shop for supplies easily and hassle-free with HP SureSupply. When it's time to install a new cartridge, you can trust that HP's all-in-one cartridge design will make replacement quick and easy.